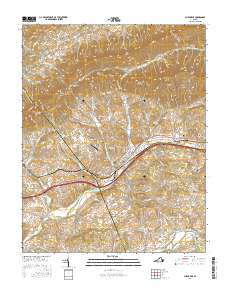 U.S. Geological Survey, 20160720, USGS US Topo 7.5-minute map for Chilhowie, VA 2016: USGS - National Geospatial Technical Operations Center (NGTOC). Layered geospatial PDF Map. Layers of geospatial data include orthoimagery, roads, grids, geographic names, elevation contours, hydrography, and other selected map features. This map depicts geographic features on the surface of the earth. It is a general purpose map for users who are not GIS experts. One intended purpose is to support emergency response at all levels of government. The geospatial data in this map are from selected National Map data holdings and other government sources.